Addie Banks’ world has been one of silence since a devastating illness when she was sixteen. Determined to stand on her own two feet, she goes to school during the day and works at night to put herself through college. Her life unexpectedly changes when she stumbles across something she wasn’t supposed to see while at work. Now, she hears a voice in her head – and it is driving her crazy. Her only hope for peace is to help the creature talking to her escape from the men holding him. Merrick knows the female who helps him is his bond mate. She may deny it. She may fight it. She may even try to run from it. It won’t matter. She is his and he will do everything he can to convince her, hold her, even kidnap her if that is what it takes to make her realize that they belong together. Merrick jerked awake and rolled. He barely madeit to the toilet before the contents of his stomachemptied. He didn’t know what they had pumped intohim this time, but he could feel his body rejecting it.Heaving, he gripped the bars until the nausea passed. Several minutes later, he slowly straightened.With a softly muttered curse, he released the bars andstepped over to the sink. He twisted the knob for thecold water. Bending, he washed his mouth out beforewashing his face. It took several minutes before he feltslightly better. Standing back straight, he rolled his shoulders.The chains around his wrists rattled as he pushed hishair back from his face. The faint memories of handson his body sent a ripple of distaste and rage throughhim. His stomach churned again, but this time for adifferent reason. He turned back to the bed andstripped the thin cover off of the mattress. Tearing athin strip from it, he dampened it and quickly wipedhis body down to get rid of the feel of Dr. Rockman’shands on it. http://youtu.be/NowYfpJsHzA To learn more about Merrick's Maiden, click here. I have just finished this series and I was in love with it. I have read/listened to several of your books. But this series was hilarious. I loved Rita and Rita2 and even DAR. In book 4 I actually laughed out loud. Thank you for your awesome writing. So I have read all these books but I don’t remember Amelia “Runt” and Derik meeting? What book do they interact in? I would like to read it,. Tansy’s Titan. Derik encounters Runt in the back alley behind the warehouse. I’m looking forward to Dagger and Jordan’s story as well. I think the most amazing thing is I ‘discover’ what happens right along with my readers when I am writing! Just finished Twin Dragons and the 2nd book of the Alliance series. Then had to reread book 1 of the Alliance, can’t wait for Dagger’s and Saber’s stories. Hi Jean I am just starting to convert my books into audio and I’m thrilled you’ll be able to share them with your daughter. Hi Gizzie, there’s no confirmed date yet but it will be this year. I wrote one for a friend and he loved it. I am working on Milo and the Wizard’s Ink. I’m excited and think even adults will enjoy it. Pls.pls.make the date for the release of Merricks story. I’m so so happy that you write a very interesting and awesome story. I hope you don’t forget the rest of the other series coz all of them I really really like. I pray that you will not suffer from mental or authors block so that you keep on writing stories that will enlighten our hearts and spirits after reading your books. God bless you. Thank you so much for your lovely post. Writer’s Block doesn’t seem to be a problem, thank goodness. The biggest issue is all the characters talking at the same time! Merrick’s Maiden will be out a little later this fall. I plan to finish Touch of Frost, Twin Dragons, Spirit Warrior, then Merrick’s Maiden. Now that I am writing full time, I look forward to discovering even more worlds! No writer’s block in sight! Merrick’s story will be out later this fall. Can’t wait for any of your books, I enjoy each of your series. Please see about having your stories done audible. I would love to hear your books. Keep writing! I’m working on audio books for all my series. Thank you for letting me know that you would love to listen to them. Can’t wait to read Merrick’s story! Hope to see a release date soon! 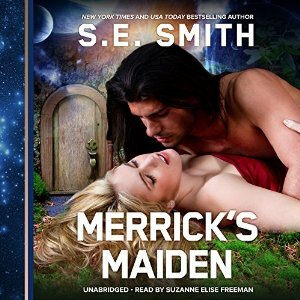 have been waiting for Merrick’s story since he first appeared in the Cosmos Gateway books, I will keep checking back for release date. My favorite series are Zion Warriors, Lords of Kassis, Spirit Pass, and Alliance. You can’t write them fast enough and I have reread them many times on my kindle. Thank you so much. I’m so glad you are enjoying my different series, Diana. I will let you know here and on FB once I have a release date for Merrick. More of your favorite series are coming up this fall. Spirit Warrior will be after Twin Dragons. I noticed that you have a release date for Merrick’s as November 2013 not 2014. Hi Laura and thanks for the heads up. I think what you are seeing is the date I published the synopsis on which was back in November 2013. The release date is yet to be set. Sorry for the confusion.